During the last 20 years, public academic research in cryptography has exploded. While classical cryptography has been long used by ordinary citizens, since World War II computer cryptography was the exclusive domain of the world's militaries. Today, state-of-the-art computer cryptography is practiced outside the secured walls of the military agencies. The layperson can now employ security practices that can protect against the most powerful of adversaries--security that may protect against military agencies for years to come. Chapters 24 and 25 (Part IV) turn to the real world of cryptography. Chapter 24 discusses some of the current implementations of these algorithms and protocols, while chapter 25 touches on some of the political issues surrounding cryptography. These chapters are by no means intended to be comprehensive. Also included are source code listings for ten algorithms discussed in Part III. I was unable to include all the code I wanted to due to space limitations, and cryptographic source code cannot otherwise be exported. (Amazingly enough, the State Department allowed export of the first edition of this book with source code, but denied export for a computer disk with the exact same source code on it. Go figure.) An associated source code disk set includes much more source code than I could fit in this book; it is probably the largest collection of cryptographic source code outside a military institution. I can only send source code disks to U.S. and Canadian citizens living in the U.S. and Canada, but hopefully that will change someday. 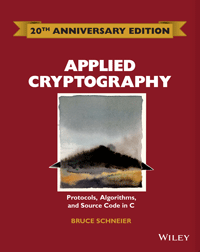 If you are interested in implementing or playing with the cryptographic algorithms in this book, get the disk. See the last page of the book for details. I have done my best to hunt down and eradicate all errors in this book, but many have assured me that it is an impossible task. Certainly, the second edition has far fewer errors than the first. An errata listing is available from me and will be periodically posted to the Usenet newsgroup sci.crypt. If any reader finds an error, please let me know. I'll send the first person to find each error in the book a free copy of the source code disk. The list of people who had a hand in this book may seem unending, but all are worthy of mention. I would like to thank Don Alvarez, Ross Anderson, Dave Balenson, Karl Barrus, Steve Bellovin, Dan Bernstein, Eli Biham, Joan Boyar, Karen Cooper, Whit Diffie, Joan Feigenbaum, Phil Karn, Neal Koblitz, Xuejia Lai, Tom Leranth, Mike Markowitz, Ralph Merkle, Bill Patton, Peter Pearson, Charles Pfleeger, Ken Pizzini, Bart Preneel, Mark Riordan, Joachim Schurman, and Marc Schwartz for reading and editing all or parts of the first edition; Marc Vauclair for translating the first edition into French; Abe Abraham, Ross Anderson, Steve Bellovin, Eli Biham, Matt Bishop, Matt Blaze, Gary Carter, Jan Comenisch, Claude Crépeau, Joan Daemen, Jorge Davila, Ed Dawson, Whit Diffie, Carl Ellison, Joan Feigenbaum, Niels Ferguson, Matt Franklin, Rosario Gennaro, Dieter Gollmann, Mark Goresky, Richard Graveman, Stuart Haber, Jingman He, Bob Hogue, Kenneth Iversen, Markus Jakobsson, Burt Kaliski, Phil Karn, John Kelsey, John Kennedy, Lars Knudsen, Paul Kocher, John Ladwig, Xuejia Lai, Arjen Lenstra, Paul Leyland, Mike Markowitz, Jim Massey, Bruce McNair, William Hugh Murray, Roger Needham, Clif Neuman, Kaisa Nyberg, Luke O'Connor, Peter Pearson, René Peralta, Yisrael Radai, Michael Roe, Phil Rogaway, Avi Rubin, Paul Rubin, Selwyn Russell, Kazue Sako, Mahmoud Salmasizadeh, Markus Stadler, Dmitry Titov, Jimmy Upton, Marc Vauclair, Serge Vaudenay, Gideon Yuval, and Glen Zorn for reading and editing all or parts of the second-edition; Lawrie Brown, Leisa Condie, Joan Daemen, Peter Gutmann, Alan Insley, Chris Johnston, John Kelsey, Xuejia Lai, Bill Leininger, Mike Markowitz, Richard Outerbridge, Peter Pearson, Ken Pizzini, Colin Plumb, RSA Data Security, Inc., Michael Roe, Michael Wood, and Phil Zimmermann for providing source code; Paul MacNerland for creating the figures for the first edition; Karen Cooper for copyediting the second edition; Beth Friedman for proofreading the second edition; Carol Kennedy for indexing the second edition; the readers of sci.crypt and the Cypherpunks mailing list for commenting on ideas, answering questions, and finding errors in the first edition; Randy Suess for providing Internet access; Jeff Duntemann and Jon Erickson for helping me get started; assorted random Insleys for the impetus, encouragement, support, conversations, friendship, and dinners; and AT&T Bell Labs for firing me and making this all possible. All these people helped to create a far better book than I could have created alone.